5/1 Gariahat Road (Near Ballygunge Phadi), Kolkata - 700019. November 9th, Sunday, Evening, Surashree Kesarbai Kerkar Smriti Sangeet Samaroha, Kala Academy, Goa. September 18th, Thursday, Evening Concert, APositsia festival, Saint Petersburg, Russia. September 20th, Saturday, ICMC Dallas, Texas. September 26th - October 2nd, Residency workshops and daily guitar clinic in LA. October 4th, Saturday, Herrick Chapel, Occidental College, Los Angeles CA. October 6th - 7th, Furman, SC University, [ Debashish Bhattacharya with drummer Jeff Sipe and table player Subhasis Bhattacharya ]. October 8th, Wednesday, Furman University's McAlister Auditorium, 8:00 PM [ Debashish Bhattacharya with drummer Jeff Sipe and table player Subhasis Bhattacharya ]. October 9th - 12th, Richmond Folk Festival, Richmond VA.
October 18th, Saturday, LEAF [ Lake Eden Arts Festival ], Black Mt. NC [ Modern India with muralist Molly Rose Freeman ]. October 24, Friday 2014, St. Peter's Church 619 Lexington Avenue New York, NY. A Celebration of Indian Classical Music! October 24, Friday, 2014 including concert and interactive session with the artiste. Venue: St. Peter's Church 619 Lexington Avenue New York, NY. An art tradition from South Asia, from the pure traditional Gharanas, to regional folk traditions, to more recent blends and fusions..... Is this innovative project, HarmoNYom will be presenting a new and original series of 4 concerts, celebrating Women and the richness and heritage of Indian Classical music. Anandi Bhattacharya is the youngest and disciple of Vidushi Shubhra Guha. 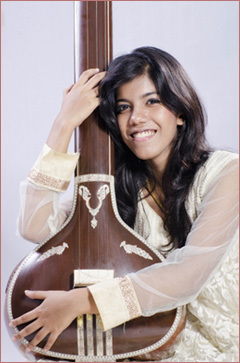 Anandi aka Sukanya Bhattacharya became a child musical prodigy in a family filled with renowned musicians and singers. Her father, slide guitar maestro Debashish Bhattacharya. She performed extensively with her father first time in USA in the year 2012 at the age fourteen. She has performed in NPR tiny desk concert as well extensively in UK and Australia recently. 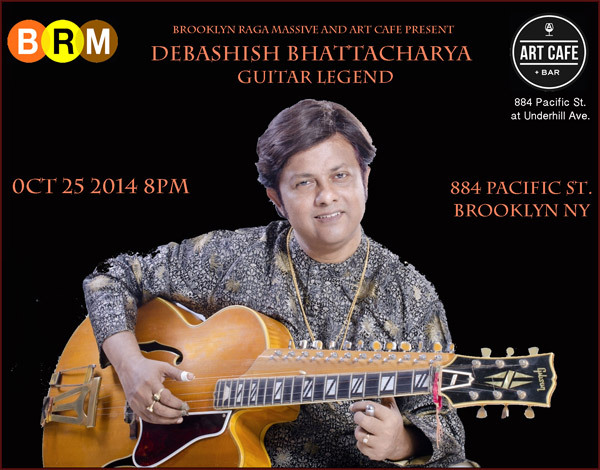 October 25th, Brooklyn Raga Massive concert series, with Subhasis Bhattacharjee on Tabla. October 31th, Hogskolen i Nord-Trondelag (HiNT University College) Trondheim noon workshop, Norway. November 1st, Evening Concert, Dokkhuset, Trondheim, Norway. August 23rd , 2014, at The Caleb Auditorium [ 7 pm. ], Saiacs CEO CENTRE, Bangalore, Karnataka. 18th July, 2014, Friday, 8.30pm, Venue: Dunstan Playhouse, Adelaide Festival Centre, Adelaide. 19th July, 2014, Saturday, 5pm, Venue: Space Theatre, Adelaide Festival Centre, Adelaide. July 20th - 25th, 2014 , - Indian Music Masterclass, Mittagong, Australia. Master slide guitarist Debashish Bhattacharya. Percussion & vocals: Subashish & Anandi Bhattacharya. May 7th, Wednesday, Charter Square, Bury St Edmunds. May 9th, Friday, Wiltshire Music Centre, Ashley Road, Bradford on Avon. May 10th, Saturday, Pontardawe Arts Centre, Herbert Street, Pontardawe. May 11th, Sunday, Rich Mix, 35-47 Bethnal Green Road, London E1 6LA. May 13th, Tuesday, Poole Lighthouse, 21 Kingland Road, Poole. May 14th, Wednesday, The Stables, Stockwell Lane, Milton Keynes. May 15th, Thursday, The Junction, Leisure Park, Cambridge. May 16th, Friday, The Sage Gateshead, St Mary's Square, Gateshead Quays, Gateshead. May 17th, Saturday, NCEM, St Margaret's Church, Walmgate, York YO1 9TL. May 18th, Sunday, mac,Cannon Hill Park, Birmingham B12 9QH. January 3rd, 2014, Saptak Music Festival, Ahmadabad, Gujarat. January 9th, 2014, State Music Academy (Music Festival). January 12th, 2014, Madhyamgram, north 24parganas, West Bengal. January 19th, 2014, Garia, Srirampur, Kolkata. February 1st, 2014, G. D. Birla Sabhagar (Evening show), Kolkata. March 16th, 2014, HILO (Big Island), Hawaii. Date TBA, Kauai Islands, Hawaii. Date TBA, Punahou School (Day Concert),Hawaii. Date and venue TBA, May, 2014, Europe Tour (Calcutta Chronicles - band).